In this episode of the 1970s anime series Star Blazers (1979), the Argo -- half-way to the distant Iscandar -- comes into contact with a strange alien race of sentient bee-people on the world called Beeland. Nova and IQ9 become stranded on Beeland after a fighter crash, and are captured by revolutionary forces that reject their queen Melina's alliance with the Gamilons. 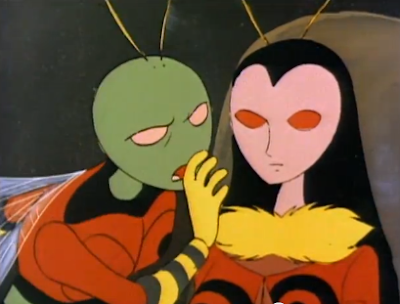 So...this is one of the weirder episodes of Star Blazers thus far. 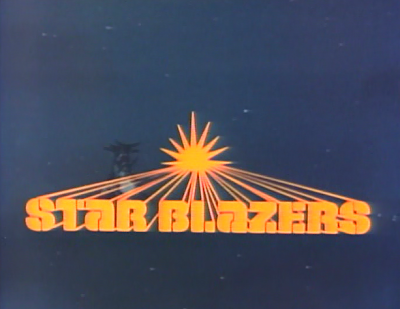 Although the story continues Star Blazers' overarching World War II-in-space metaphor (with Beeland filling in for a Pacific island, or perhaps an African nation...), the episode actually focuses more intently on IQ9, who -- for the first time -- professes intense emotions. In fact, IQ9 (a robot) notes this week that he actually boasts more intense emotions even than humans, and that he wants to marry Nova. Captain Avatar suggests, in response, that perhaps it is time for IQ9's "10,000 mile check-up." But this is no laughing matter, and IQ9's wedding proposal actually causes Nova to crash her fighter on Beeland in the first place! Emotional or not, the mechanical IQ9 ought to keep his mind (circuits?) on his job. 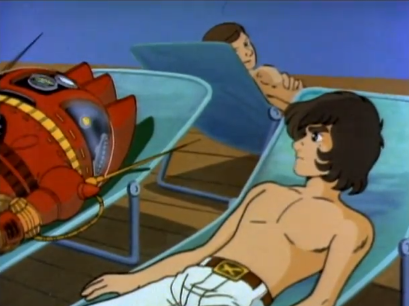 Over the course of the episode, IQ9 explains how he has hopes, dreams and fears like any human, and mopes that he is just "scrap metal" to Nova. She eventually recognizes his heroism and gives him a hug after he saves the day, but this sudden burst of (bizarre) character development involving IQ9 is weird, to say the least. So, is Nova the only female on the Argo? I ask because I'm actually not certain at this juncture. We don't ever see any other females, though certainly the Star Force would be -- ahem -- manned by more than one woman, right? 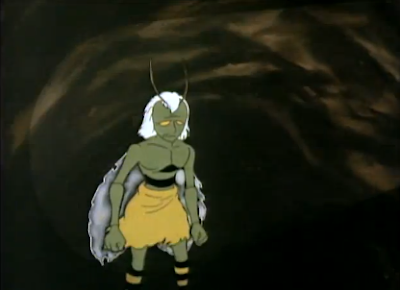 Beyond the IQ9 plot-line, this episode features a revolution among the Bee People, aliens clearly based on terrestrial bees, right down to the presence of the queen. 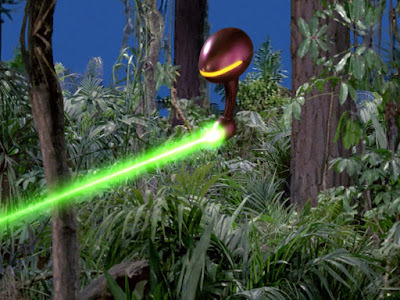 Although the idea of intelligent bipedal bees is a little bit silly, it's always welcome for the Star Force to interface with extra-terrestrial characters who are not Gamilon. This episode gives an insight into Gamilon standard operating procedure too. They ally themselves with a planet (like Beeland), and then go about seizing control of its resources. It's a view of imperialism or colonialism, pure and simple. John interesting review of this episode exploring the colonialism of the Gamilon Empire with no less than a bee colony civilization. 1.) Is Nova the only woman on the ship? Technically, no, as we saw another female crewmember who announced her engagement in the episode in which everyone calls home before leaving the solar system and we saw some others in background shots in earlier episodes, but they disappeared as the story progressed. The story goes that the Space Battleship Yamato producer, Nishizaki, later decided that he wanted Yuki/Nova to be the only female crewmember and that the other women went into the sleep tubes ofscreen. The 2012-2013 reboot rectifies this by having more female characters present in the narrative throughout the series, although there has been criticism for some of the more blatantly fanservicey shots. 2.) In the orginal, the Japanese version of IQ-9, Analyzer, frequently harasses Yuki sexually, pinching her bottom and lifting her skirt. The 2012-2013 reboot removes this aspect of the character and its fixation upon Yuki/Nova. In the 2013 reboot, the issue of a robotic emotional consciousness is examined through Analyzer developing a relationship of sorts with a Gamilon robotic entity in a story with frequent references to literary science fiction. 3.) Mark has no interest in Starsha. He does, however, develop a romantic interest in the following series "space goddess" character.